Did you know Galileo Galilei, the “father of modern science,” laid the foundation for understanding the link between exercise and bone health over 300 years ago? The renowned Italian astronomer and physicist noted that body weight and bone size are directly related in 1683. But it wasn’t until 200 years later that German anatomist Julius Wolff expanded on Galileo’s theory. Wolff discovered that mechanical stresses applied to bone influence their strength. Which is just a scientific way of saying exercise makes your bones stronger! Fast forward to the modern day, and we know that exercise is a crucial component of maintaining healthy bones and avoiding osteoporosis. See, regular exercise puts stress on your bones which helps them become denser and stronger. Plus, exercise combats age-related muscles loss (a condition called sarcopenia) which helps to keep you on your feet and avoid fall-related fractures! So read on to discover the best type of exercises for osteoporosis and how to incorporate them into your routine safely. Weight-bearing exercise is one of the best exercises you can do to strengthen your bones! See, a weight-bearing exercise is an activity that you do while on your feet, so your bones and muscles are forced to work against gravity to keep you upright. Doing weight-bearing activities places stress on your bones, in a good way, which helps them become stronger and increases your bone mineral density. Now, there are two types of weight-bearing exercise you need to know about; high-impact and low-impact. **There are times during yoga and Pilates when you perform exercises while lying or sitting on the floor. In these instances, while these exercises may be strenuous, they’re no longer weight-bearing exercises as the floor is supporting you. These would be considered non-weight-bearing, which we’ll discuss shortly. As you can tell from the name, non-weight-bearing exercises don’t involve supporting or bearing your own weight. Now, as far as osteoporosis and bone strength are concerned, non-weight-bearing exercises aren’t as beneficial as weight-bearing exercises. But that’s not to say that they aren’t helpful at all. The second superstar osteoporosis exercise category is muscle-strengthening exercise. This type of exercise is also known as resistance exercise and involves working your muscles against an opposing force. The opposing force could be a dumbbell, a resistance band, or even your own body weight. Plus, increasing your muscle strength will help you prevent sarcopenia (we’ll cover this a little further down the page) which will make you sturdier on your feet and less likely to suffer a fall! The best exercise regimen for osteoporosis and bone health will incorporate both weight-bearing and muscle-strengthening exercises. You don’t need to embark on an olympian exercise schedule, but do try to dedicate a bit of time each week to exercises like the ones we’ve listed above. To help you get started, we’ve got a whole host of exercise tutorials that cover weight-bearing, muscle-strengthening, and non-impact exercises. In the “Full Workouts” section of the list below, you’ll find video walkthroughs of entire Yoga, Tai Chi, Barre and Pilates sessions led by qualified teachers/instructors. And in the “Area- Specific Exercises” section you’ll find dedicated exercises for specific areas of your body along with short video tutorials and instructions. Just click the exercise you want to do to get started! Yoga – Improve your balance, muscle strength, range of motion and general coordination with yoga! Plus, relieve stress and anxiety while you’re at it. Our “Ultimate Guide to Yoga for Osteoporosis” is the perfect place to start. Tai Chi – Tai chi is a full mind and body practice. Studies show that regular Tai Chi can slow bone loss and help improve balance, reducing the risk of a fall. Check out everything you need to know to get started with Tai Chi here! Hip-strengthening exercises – Hip fractures are one of the most common fractures of all. In fact, there are 1.6 million hip fractures worldwide every year! But, hip fractures— like all fractures— are largely avoidable. These exercises are designed to improve your hip strength and the muscles surrounding them! Spine exercises – Anyone who’s had a Dual Energy X-Ray Absorptiometry (DEXA) scan will know the spine is one of the places that bone density is measured. Try these exercises and see if you have an improved score at your next DEXA scan. Plus, reduce your risk of vertebral fractures while you’re at it! After all, with 700,000 every year in the United States alone, vertebral fractures are the most common osteoporosis-related fractures! Shoulder-strengthening exercises – Your shoulders are integral to performing everyday tasks and maintaining your independence. So try these shoulder exercises to keep yours strong! Foot-strengthening exercises – Support your feet and they’ll support you! These foot-strengthening exercises will help keep you upright and ease any structural issues too. Wrist and forearm exercises – If you were to take a tumble, what would you use to try to break your fall? Your wrists and forearms! So make sure they’re strong enough to withstand the impact. After all, it’s better to be safe than sorry. Posture exercises – Your posture actually represents both the cause and effect of osteoporosis. As the bone density in your spine starts to decrease, you’ll start to see humped shoulders and a stooped posture. This can lead to pain and inactivity which can further your bone loss. So get ahead of the game by trying these posture exercises! Aquatic exercises – Discover some non-weight-bearing exercises you can do in the swimming pool. Aquatic exercises are perfect for those who are just starting out with osteoporosis exercises. Resistance band exercises – Resistance band exercises are a great way to do weight-bearing and muscle-strengthening exercise at the same time. Plus, you can do them pretty much anywhere. Planking exercises – Workout your core muscles with these planking exercises to improve your mobility and balance. Balance exercises – Try these simple balance exercises to feel confident on your feet. Does Exercise Alone Increase Bone Mineral Density? The Importance of Nutrition for Your Bones! Now you know the two best types of exercise for osteoporosis and have a wealth of exercise tutorials to get you started. But there’s still a burning question to answer. Well, the short answer is no. At least not outright. Exercise can increase your bone density, but it’s not enough to counterbalance the natural bone loss you experience when you’re around 40-years-old and above. See, when you reach this age, your natural bone remodeling process becomes unbalanced. Your bone-resorbing osteoclasts start to remove bone quicker than your bone-building osteoblasts can replace it. In fact, you can expect to lose about 1% of your bone density every year from 40 onwards. The majority of studies on exercise and bone mineral density (BMD) show exercise can slow bone loss, but it isn’t sufficient to increase bone density alone. In fact, we had our Resident Bone Health Expert, Lara Pizzorno, take a deep-dive into the medical journals for every relevant study she could find. Lara surveyed hundreds of studies that fell into one of the two categories listed above. But after careful review, we only included a handful in our summary below. Why? Because many of the studies just weren’t designed to provide accurate, reliable results. Here at AlgaeCal, we truly care about our readers so only the best will do. The gold standard of studies is a “randomized controlled study.” In a randomized controlled trial (RCT), participants are randomly allocated to a treatment or a control group, so a lot of the bias and extraneous variables encountered in other study designs is reduced. So, in the case of exercise and bone mineral density, an RCT would randomly allocate half of the participants to the treatment group– exercising– and the other half would be allocated to a control group who wouldn’t exercise at all. A truly accurate study would also match the two groups accordingly. So for exercise and bone density age, weight, diet, and bone health would be taken into account too. If you’d like to see a list of the studies we didn’t include in our summary, please refer to the list of references in the drop down menu beneath our summary. Only one study on the effects of exercise and fracture risk was of high enough quality for us to include here. Name: The role of physical activity in the prevention of osteoporosis in postmenopausal women-An update. Type of study: A review of relevant randomized controlled trials (RCTs) and prospective cohort studies. A prospective cohort study is a study that follows a group of similar individuals for a prolonged time. The individuals tend to differ concerning certain factors of the study, to determine how these factors affect a certain outcome. Summary: Of the seven studies reviewed, three were RCTs, one was a controlled, un-randomized study, and three were prospective cohort studies. The RCTs drew differing conclusions on whether exercise increases BMD. But two of the prospective cohort studies found that exercise is linked with a reduced risk of hip fracture. Results: This review supports the theory that exercise can reduce the risk of fractures, particularly hip fractures. Full name of the study: Effects of a targeted multimodal exercise program incorporating high-speed power training on falls and fracture risk factors in older adults: a community-based randomized controlled trial. Summary: This study evaluated 162 men and women aged 60 or older for a year. All participants had risk factors for falls and/or low bone mineral density. They were randomly assigned to either an osteo-cise program or a control group. The osteo-cise group exercised three times a week and participated in an osteoporosis awareness program. The exercises included high-velocity progressive resistance training (HV-PRT), weight-bearing impact, and challenging balance/mobility activities. All exercises were taught by instructors who had completed an “osteo-instruct” course designed specifically to teach instructors how to lead exercise programs for people with low bone density safely. The control group were instructed to continue their usual care regimen. Note: All participants took a daily vitamin D supplement (1000 IU) and a calcium supplement (700 mg) for the duration of the study. After 12 months, the osteo-cise program led to modest mean net gains in femoral neck (0.6%), hip (0.6%) and lumbar spine (1.5%) BMD compared to their baseline levels. The control group saw a mean 0.3% increase in lumbar spine BMD, a -0.4 decrease in femoral neck BMD and a 0.5% increase in hip BMD. The participants in the osteo-cise group saw improvements in muscle strength, functional muscle power, and dynamic balance improved too. (All compared to the control group). There was no effect on total body lean mass or mobility. And there were no differences in fall rates either. Results: This study was designed primarily to examine the effect of high-intensity exercise on fall and fracture risk in older adults. But the authors concluded that the sample size was insufficient to draw definitive conclusions about the efficacy of this program on preventing falls. It was supportive of exercise slightly increasing BMD, however. But remember you lose around 1% per year due to the natural bone remodeling process so this might not translate to outright BMD increases. Summary: 173 sedentary, overweight/obese, postmenopausal women took part in this 12-month study. They were all 50-75-years-old and were randomly assigned to an aerobic exercise intervention or a stretching control group. The exercise group did 45 minutes of moderate-intensity aerobic exercise five days a week for 12 months. The control group attended 45-minute stretching sessions once a week. Results: This study showed that both aerobic exercise and stretching have a very minor positive effect on bone mineral density. Both groups basically maintained their bone mineral density after 12 months. Now, this doesn’t sound so great, but remember, these women would expect to lose about 1% of their BMD during the course of the year. So exercising and stretching managed to at least counterbalance the loss. Summary: 101 postmenopausal women with low bone mass were randomly assigned to either; eight months of twice-weekly, 30-minute, supervised high-intensity resistance and impact training (HiRIT) or a home-based, low-intensity exercise program (CON). The HiRIT group performed very high-intensity exercises like deadlifts and jumping chin ups. The CON group, on the other hand, focused on low-load resistance training (lunges, calf raises etc.) and stretching exercises. After eight months, all participants increased their muscle strength. But the CON group lost BMD at all sites measured. And the HiRIT group mostly maintained their BMD, but some actually experienced a small loss in BMD too. Results: This study showed that high-intensity exercise can help counterbalance natural bone loss, if not increase BMD outright. The fact that the HiRIT group generally maintained their BMD while the control group lost BMD suggests the exercise helped to at least slow/balance out the bone loss caused by the natural bone remodeling process. Summary: This was a three-year exercise trial. One hundred and thirty-seven began the trial, but due to the long-term nature and fairly intense exercise schedule there were numerous drop outs. This shows that intense, prolonged exercise programs can be difficult for older adults to adhere to, but those that did complete the trial saw the following benefits. Of the participants that did complete the trial, 48 osteopenic women with no medication or illness affecting bone metabolism participated in the exercise group. And 30 women served as the non-training control. Important note: this study was not a randomized trial. The women who took part chose which group they wanted to be in. This helps to explain why the groups were not equal sizes. The exercise group performed two group training and two home training sessions a week. The exercises included jumping exercises, strength-training exercises and flexibility exercises. These exercises were switched every 12 weeks to increase intensity and maintain compliance. The control group continued their normal lifestyle. Important note #2 – Both groups took calcium and vitamin D supplements, which varied in dosage according to the individuals nutritional intake. At the end of the study, the exercise group saw bone density increases at all sites measured. The control group saw decreases in their BMD. Results: This study showed that exercise did can increase BMD in early postmenopausal women compared to a non-exercising control group. But the exercise program involved in this study was fairly intense and could be hard for the average older adult to follow. Summary: This review examined 43 RCTs concerning exercise and osteoporosis in postmenopausal women with a combined 4320 participants. People who exercised had, on average, 0.85% less bone loss than those who didn’t exercise. People who engaged in combinations of exercise types had, on average, 3.2% less bone loss than those who did not exercise. People who exercised had, on average, 1.03% less bone loss than those who didn’t exercise. People who exercised by strength training had, on average, 1.03% less bone loss. Important note – These conclusions were based on estimates. The authors noted that not all of the studies they reviewed were high quality and also mentioned that some of the results could have happened by chance. That means, for some of the studies, extraneous variables such as diet, age, weight etc. could have contributed to the results besides exercise alone. Results: The review was supportive of exercise positively influencing bone density compared to no exercise. The authors also noted the importance of exercise, adequate calcium intake, and minimizing hormonal changes that cause bone loss as a three pronged strategy to increase BMD. Results: This review suggests exercise can halt bone loss, which is a valuable accomplishment. But to significantly increase BMD, diet and hormonal changes must also be taken into consideration. 1999 – The effects of progressive resistance training on bone density: a review. As you can see, the majority of studies support the theory that exercise slows bone loss and helps to balance out the natural bone remodeling process, but can’t increase BMD outright. Still, losing less bone than you would naturally is still a step in the right direction! But as you’ll see in just a moment, increasing bone density is possible with some help from nutrition. A little earlier, we mentioned that increasing your muscle strength will help you prevent sarcopenia. Sarcopenia is a common condition associated with aging where you start to lose your muscle mass and replace it with fat. The exact amount of muscle loss varies from person to person, but recent research suggests that the average rate of loss for people over 70 is 0.5-1% per year. As you can imagine, losing muscle mass means you become weaker. Plus, it further affects the decline in balance associated with aging. And this significantly increases the risk of fracturing a bone from a fall! So that’s the bad news. But the good news is that you can stave off sarcopenia, or even reverse it, with the muscle-strengthening exercises we outlined above! You may already know that you have specialized cells called osteoblasts. Your osteoblasts build new bone after your old, worn out bone is broken down by osteoclast cells. After your osteoblasts have completed their bone-building, they become embedded in the bone matrix they’ve produced and turn into osteocytes. Osteocytes are very long-lived cells (their average half-life is 25 years) that form a signaling network in your bones. This network is like the nervous system in the rest of your body; it transmits signals to direct and balance the activity of your bone-building osteoblasts and your bone-resorbing osteoclasts. And here’s where exercise comes in: osteocytes tend to die off as you get older. Especially if they’re not stimulated by “mechanotransduction.” Now, in plain English, mechanotransduction means a movement that puts stress on muscles, which in turn puts stress on bones. In other words, exercise! Those osteocytes we were just talking about have even more bone benefits! In response to exercise, osteocytes send signals that increase the pool of mesenchymal stem cells– cells that can grow up to become osteoblasts, adipocytes (fat cells), or muscle cells. It’s a win-win situation! What’s more, only one other strategy will effectively increase your production of mesenchymal stem cells AND convince them to become either osteoblasts or muscle cells instead of fat cells. Consuming enough of the omega 3s, eicosapentaenoic acid (EPA) and docosahexaenoic acid (DHA). (We’ll cover omega 3s in more depth in “The Importance of Nutrition for Your Bones” section below). Lastly, when osteocytes are turned on in response to mechanical loading (putting stress on muscle through exercise), they stop secreting a protein called sclerostin. Plus, they increase the secretion of proteins involved in Wnt signaling. Now, sclerostin inhibits the development of osteoblasts and bone formation. And Wnt signaling promotes the production of both bone-building osteoblasts and myocytes (muscle cells). Another win-win! Nutrition steals the show when it comes to increasing your bone density. In fact, our award-winning studies show you can increase your bone density by providing your bones with proper nutrition alone– even without exercise. But to maximize your bone-building results, you’ll need the supporting cast. We’ll outline the nutrients that directly impact your exercise efforts below and the 13 minerals and 3 vitamins essential for supporting healthy bones in “The Nutrition Roundup” section a little further down. Everyday things like smoking, certain prescription drugs, and even refined sugar cause inflammation in your body. If this inflammation persists, it can become chronic. And chronic, low-grade inflammation can accelerate your bone loss! Check out the “Overexposure to Toxins” section of our “Osteoporosis Causes” page for more information. This trio of factors will give you the best results when it comes to strong, healthy bones. 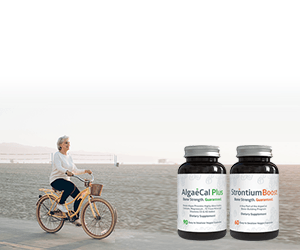 Now, as far as the essential bone-building nutrients are concerned, there are 13 minerals and a handful of vitamins that are essential for supporting healthy bones. You can read all about them on our “Osteoporosis Diet and Nutrition” page. But there are also several nutrients (some of which are also the essential bone-building nutrients) that directly impact the benefit of your osteoporosis exercises. So let’s take an in-depth look at those now. You know that calcium is the cornerstone of bone health, right? But what you might not know is that getting enough calcium is the deciding factor in whether exercise delivers anti-fracture benefits or not. It’s true! Overwhelming evidence shows that people who don’t get enough calcium have lower bone mass (and a greater risk of fracture) compared to people the same age who consume adequate or high levels of calcium. And that goes for young people as well as older folk too! So how much calcium do you need to see bone benefits from exercise? Well, research suggests the minimum amount of calcium you need to consume is 1,000 mg/day. Anything less than this amount, and exercise has little to no effect on increasing bone mass. A review of data from 16 exercise intervention trials in peri- or postmenopausal women demonstrated this “calcium threshold” for exercise. The review studied the effects of calcium intake and exercise on BMD in the spine and radius (the shorter and smaller bone of the two long bones in the forearm). Increasing calcium intake without the stimulus of exercise had a very minor effect on BMD in the spine. But when the participants consumed less than 1,000 mg of calcium per day, exercise didn’t improve spine BMD at all! It took both exercise and sufficient calcium to increase BMD. Interestingly, exercise only had very minor effects on the BMD of the radius, even when the participants were consuming adequate amounts of calcium. But there’s a logical explanation for that; most training programs don’t put sufficient stress on the radius to make a difference. Even very high-intensity resistance and impact training doesn’t increase BMD in postmenopausal women with osteopenia and osteoporosis. In the “LIFTMOR trial,” 101 postmenopausal women with low bone mass were randomly assigned to either: eight months of twice-weekly, 30-minute, supervised high-intensity resistance and impact training (HiRIT) or a home-based, low-intensity exercise program (CON). All participants (in both groups) increased their muscle strength. But, the CON group lost BMD at all sites measured. And the HiRIT group mostly maintained BMD, but some actually lost BMD. Remember, you lose about 1% of your bone density every year after the age of 40. So this study shows that even high-intensity exercise isn’t enough to counterbalance that loss. And what’s more, these women were consuming a diet that provided far more calcium than typical– around 900 mg or more a day. (Just under that magic threshold of 1,000 mg/day). Plus, this was a serious workout. As we mentioned in the “Does Exercise Alone Increase Bone Mineral Density?” section above, the ladies in this study were performing incredibly high-impact, high-intensity exercises like jumping chin-ups with drop landings. The good news is that no fragility fractures occurred. So, this study shows that women with osteopenia, or even osteoporosis, can engage in high impact training when supervised! The bottom line: Exercise without sufficient calcium intake will not increase BMD. In postmenopausal women, exercise appears to provide a necessary stimulus for incorporating more calcium into the skeleton. But there has to be enough calcium present for bone-building to take place. And you need vitamins D and K2 to work with calcium to benefit your bones. There’s a reason people take protein shakes after a workout…protein is crucial for muscle growth! And remember, your skeletal and muscular systems are tightly intertwined. So basically, protein builds your muscle mass, which helps to keep your bone health in check. But as you age, you become less able to convert protein into muscle. This is actually a contributing factor for sarcopenia! If you recall, in the “Benefits of Exercise for Bone Health” section, combatting sarcopenia was one of the benefits we listed. But to give yourself the best chance of avoiding sarcopenia eating enough protein is crucial too! So how much protein is enough? Well, that’s where things get a little confusing. See, the original recommended daily allowance (RDA) of protein for older adults doesn’t appear to enough. The original RDA is 0.8 g of protein per kg of body weight. But that amount was set with preventing a deficiency in mind. Not for promoting optimal health. Experts are now suggesting that the original RDA could actually lead to muscle loss in older adults! Don’t worry though, you can read all about the new RDA for protein experts are suggesting in our “Everything You Need to Know About Protein and Bone Health” post. It covers the best sources of protein, and some more in-depth information on why it’s important for your bones too. You may know that you need vitamin D to be able to absorb the calcium you consume. But get this– vitamin D can help you boost your muscle growth and stay on your feet too! See, your muscle fiber membranes are loaded with vitamin D receptors. And when these receptors get a little vitamin D exposure, they trigger muscle growth! Now, the ‘Institute of Medicine’ still claims there isn’t sufficient evidence of vitamin D preventing sarcopenia. But in Europe, a panel of experts determined a vitamin D level of at least 30-44 ng/mL (nanograms per milliliter in your blood) was necessary for musculoskeletal health. The “at least” here is important. Even 44 ng/mL of vitamin D isn’t enough for your bones. Ideally, you need 50-80 ng/ml for bone and immune health. Omega 3s are renowned for their anti-inflammatory properties. (This makes omega 3s a vital piece of the bone health puzzle as chronic inflammation accelerates bone loss!) But omega 3s also help preserve lean body mass, too. Especially eicosapentaenoic acid (EPA) and docosahexaenoic acid (DHA). These two omega 3s increase the activation of an enzyme called mTOR. Now, mTOR activation is a big deal. mTOR is the key regulator of muscle protein synthesis. And muscle protein synthesis is the process of repairing and building muscles tissue when you exercise! Plus, mTOR regulates a bunch of other vitally important cellular processes that enhance health and slow the aging process too! Getting all of the above into your diet is a challenge though. It’s almost impossible to regularly achieve the recommended daily intake of calcium for people over 50 (1,200mg/day). And taking enough supplements to cover every vitamin and mineral your bones need can cost a small fortune… and cause a real headache as far as scheduling is concerned! What’s more, when you use the Bone Builder Pack, you’re guaranteed to see an increase in your bone mineral density at every follow-up DEXA scan! It’s the perfect nutrition companion to any osteoporosis exercise regimen and it’s 100% risk-free to give it a try! Now, the Bone Builder Pack doesn’t contain omega 3s. But Triple Power Omega 3 Fish Oil has you covered in that department. Triple Power provides over 1400 mg of omega 3s, including a combined 1200 mg of EPA and DHA which we covered above. And the best part? It’s naturally flavored with mango to make it the best-tasting fish oil product you’ll have ever tried. No fishy taste or fish-burps with Triple Power, and that’s a guarantee. That just leaves protein. Don’t worry though; it’s super easy to add protein-rich foods to your meals. In fact, you can discover the top protein sources in our “Everything You Need to Know About Protein and Bone Health” post. Exercising when you already have osteoporosis can seem scary. You may think that performing a range of exercises and being more active than usual would increase your chance of taking a tumble and suffering a fracture. But hopefully the information we’ve provided on this page helps ease your mind and demonstrates that exercise is actually an important part of combating osteoporosis. But of course, you should approach osteoporosis exercises with your safety in mind and try to stay realistic. You know your body better than anyone, so listen to it and don’t try to take on too much too quickly, especially if you’re just starting out with osteoporosis exercises. The exercise walkthroughs we provide are recommended specifically for people with osteoporosis, but many of them also have beginner versions for you to try first. If you’re just starting out on an osteoporosis exercise, we highly recommend that you check in with your doctor first. Your doctor knows your bone health history as well as your general health, so they can help you tailor an exercise program to your stage of osteoporosis, fitness level, and overall health. Below is a checklist to keep in mind to help keep you and your bones safe while exercising. Remember, exercise is beneficial for your bone health, but safety always comes first! Avoid contraindicated exercises – You want to steer clear of any exercises that can cause you pain or injury. For osteoporosis exercises specifically, avoid exercises that involve forward flexion of the spine (bending forward at the spine to make a “C” shape) involve twisting actions or include excessive bending or bouncing stretches. Focus on quality, not quantity – Performing an exercise with the correct form will help protect you from injury. Try to exercise in front of a mirror if possible so you can keep an eye on your form! Work at an intensity that suits you – When it comes to exercise, you need to push your body enough to gain a benefit. As you become stronger or more flexible, you’ll find the exercises you began with will become easier. These exercises won’t test your body enough anymore and you’ll cease to improve, so you need to gradually progress your exercises. But, you don’t want to put yourself at risk by taking too much of a leap. A great way to both progress your exercises and maintain your safety is to monitor the exercises you do. Let’s take a bicep curl as an example. Say you start off at two sets of 6 repetitions with a 2 pound weight. Record how the exercise feels every time you perform it, and when it gets too easy, try doing two sets of 10 repetitions with a 2 pound weight. And from there you can increase the weight, and the sets and so on! Maintain your posture and technique – Keep your posture and technique in mind when you’re performing any exercise. These are both important to keep your body alignment in check so that you’re working the parts of your body the exercise is intended to work and to help you avoid injury too. Take care of your joints – Looking after your joints is very important. After all, they support your body and help to keep you on your feet and independent! Now, the best way to care for your joints is to keep the muscles that support them strong. So, if you know your knees are a little on the weak side, for example, include some exercises in your regimen that work the surrounding muscles; your quadriceps, glutes, and calves. Well, Metabolic Equivalent (MET) hours are used to measure the intensity of exercise. The MET measures the amount of energy you burn during exercise and various physical activities. For reference, 1 MET is equal to the number of calories burned at rest: 30-38 calories for every 30 minutes. And you burn 3-6 METs of energy with moderate exercise: 90-225 calories in a 30-minute workout. So how many MET hours of exercise do you need a week? Well, active women with a minimum of 24 MET hours of at least moderate activity per week have a 55% lower risk of hip fracture according to The Nurses’ Health Study! (But remember, this is relative risk compared to sedentary women getting less than 3 MET-hours per week). Now, the exact number of calories you burn will vary depending on two things. How much muscle mass you have, and how vigorously you use it during the exercise. The good news here is the more you exercise, the more muscle you will have, and the more calories you will burn. To maximize the impact your exercise regimen has on your bone health, you should try to tick off everything on the following checklist. Exercise at least three times a week for 1 hour – An hour every day of some form of weight-bearing movement is even better when you feel ready for it! Impose an unusual loading pattern on your bones – You do want to repeat movements until the muscles you’re using get the message to get stronger. But you don’t want your entire workout to only include the same movement over and over again. That’s boring and ineffective. You want movements that involve a wide variety of muscle groups and movement direction. A Word on Recovery: Exercising at 70% of your maximum effort is tough work! But did you know omega 3 fatty acids can maximize your workout by reducing inflammation in your body and reducing your recovery time too? Remember, Triple Power Omega 3 Fish Oil provides over 1400 mg of omega 3s per tablespoon. And it tastes so good you’ll want to workout just to be able to have a spoonful afterwards! And last, but definitely not least, your workouts should be combined with optimal nutritional support: protein, calcium, vitamin D3, vitamin K2, magnesium, boron and other trace minerals. Exercise is an important aspect of your bone health. Especially weight-bearing and muscle-strengthening exercises. But exercise alone can’t improve your bone density. For that, you need to combine your exercise program with proper nutrition. Specifically, your bones crave 13 minerals and 3 vitamins– all of which are provided in the Bone Builder Pack! Not only is the Bone Builder Pack a super convenient way to provide your bones with the nutrients they crave, it’s GUARANTEED to improve your bone mineral density! It’s the perfect companion for any osteoporosis exercise regimen. And remember, omega 3 fatty acids and protein can maximise the benefits of your exercise program too! Maximize Your Exercise Routine With The Bone Builder PackAnd Guarantee Denser BonesGet Yours Here! The relative risk is important to take into account here. 55% lower risk of a hip fracture sounds substantial, but percentages can often seem a little distorted when you look at the context. The study states that per 100,000 women, the incidence of hip fracture for those that exercised less than 3 MET hours or less a week was 230. The incidence of hip fracture for those that exercised 24 MET hours or more a week was 100. So exercising more did result in less hip fractures but 55% lower risk exaggerates the results somewhat. The more accurate measure of risk is absolute risk. The absolute risk is merely the difference between the two sets of data. In this case, 230 for the women exercising less than 3 MET hours a week, and 100 for the women exercising 24 MET hours or more a week. So the absolute risk of a hip fracture is actually far less than 55%. 230 is 0.22% of 100,000 and 100 is 0.1% of 100,000. So an absolute difference of 0.12%.